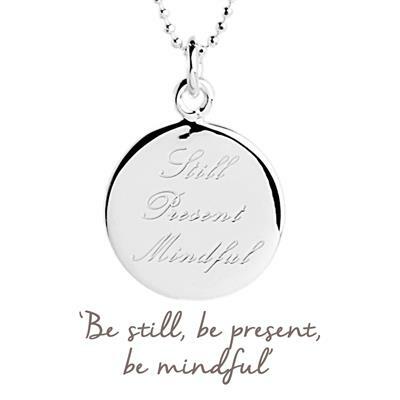 This beautiful necklace from the Mantra collection is made from 925 Sterling Silver and features a disc engraved with "Still. Present. Mindful". Wear your Mantra necklace to inspire you every day and use its positive affirmation as a way to gently steer you on a positive path. Remind yourself to embrace each moment as it comes. Why not personalise your mantra necklace with a word, date or name? Have yours engraved here.